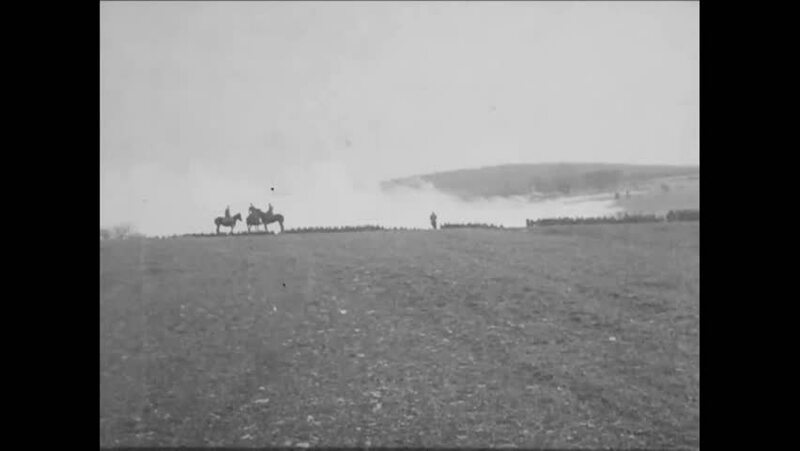 CIRCA 1919 - The 54th Infantry makes a smokescreen in a sham battle in France. hd01:22CIRCA - 1918 - Soldiers in the 42nd Division practice fighting with bayonets during training in Rolampont, France in WWI. hd00:211950s: Field. Ruins of castle. hd00:27EUROPE, 1930s: German planes and soldiers lined up on runway. Two German paratroopers salute each other. Paratroopers head to planes as they carry parachutes in back packs. hd01:03CIRCA 1940s - American troops deploy to the Aleutian Islands in 1942.
hd00:58CIRCA 1918 - Officers of the 12th Light Railway Enginer Regiment pose and Gabby Stret plays baseball with soldiers in Baccarat, France. hd00:30CIRCA 1918 - Soldiers harvest vegetables on a farm. hd01:08CIRCA 1918 - A military band marches on a field and troops eat in France in World War 1.